Wow I am in such a slump reading wise . After I put this book down it took me a couple of days to recoup my mind. 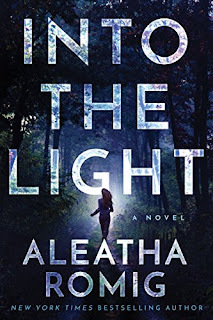 Aleatha Romig really knows how to bring it . 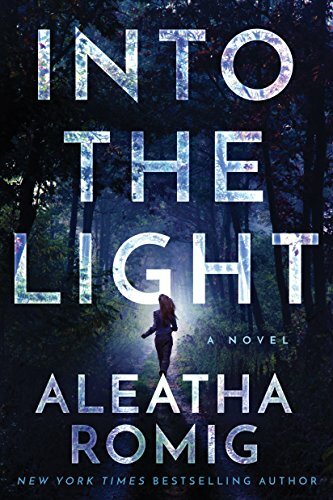 INTO THE LIGHT is a page turner . What do you do when you wake up blind and can't remember your life . That's what happens to Sarah Adams . She loves the darkness cause she is scared of what will happen if her sight came back . Then there is Stella Montgomery . she is after a story that will take her right up against the cult The light. The more each of them dig into the LIGHT the more questions come to light and everything comes with a price . I must say that the author never disappoints and she hasn't disappointed me with this one . Her characters are so well written and complex , you can't help but fall for them . You want to cheer them on and make sure they stay safe The book actually has three points of view Sara , Stella and Jacob . Sara is at first a very frightened and confused . She has woken up and is blind but she is trying to be strong . As you read you see Sara come into her own and become stronger and stronger . Now Stella is strong and man she is such a go getter . She is willing to sacrifice herself for a story . I want to be her when I grow up . She is a great strong woman . I must say I like that Jacob is part of the story also. He is just creepy and eerie . He is such a strong person and he isn't really that nice . But as you start to get into Jacobs mind we see that he isn't all that he puts out there. We actually feel the love he has for Sara I am so grateful for that point of view because there were a couple of times I really wanted to hit him with the frying pan repeatedly. The author really knows how to take us on an adventure . The story is intriguing and the characters are very well written . The mystery of Sara's accident is plausible and the cult story is actually relevant . I couldn't put this book down I was hooked from page one . The mystery had me hooked and reading well into the night . There is a cliff hanger at the end of this book but book two is out so you can jump in right away to finish off their story. So if you want a book that will keep you reading and guessing check out this series . You will not be disappointed .